The Reverend Dr. Walter J. Roy, Sr. was born and raised in Pittsburgh, Pennsylvania where he accepted the Lord as his personal savior at age 18 as a member of Sixth Mount Zion Baptist Church. Dr. Roy served as a bus driver for the church; taught as a Sunday school teacher; and served as Assistant Sunday School Superintendent. He was appointed to the Deacon Ministry and assumed various other duties. Soon after Pastor Roy’s ordination as Deacon, he received the call to preach the Gospel of our Lord and Savior Jesus Christ. He was licensed by Sixth Mount Zion Baptist Church, with the Reverend Elmer Williams officiating in June 1980. While attending Virginia Union University, Dr. Roy became affiliated with Grayland Baptist Church, Richmond, Virginia where the Reverend Dr, Clifton Whitaker, Jr. is pastor. There, he served as minister to the youth and facilitated many and varied activities with them. For two years upon returning to Pittsburgh, Pennsylvania, Dr. Roy attended Monumental Missionary Baptist Church were the Reverend Thomas Smith is Pastor. He served as an Associate Pastor with duties carried out as needed by church and pastor. In 1988, Dr. Roy returned to Richmond and the Grayland Baptist Church Family. He was called to pastor the First Baptist Church, Ordinary, Virginia in September 1990 and served as pastor for 12 years. Dr. Roy was called to pastor Guildfield Baptist Church, Powhatan, Virginia in November 2005 and served as pastor through December 2010. 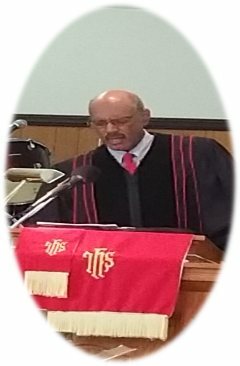 Presently, Dr. Roy is serving as pastor-elect at Saint Luke Baptist Church, West Point, Virginia. Pastor Roy is employed with Gloucester County Public Schools at Peasley Middle School as a seventh grade Civics/Social Studies teacher. He attended and graduated from George Westinghouse High School, Pittsburgh, Pennsylvania; The University of Pennsylvania, Philadelphia, Pennsylvania; and Samuel DeWitt Proctor School of Theology Virginia Union University, Richmond, Virginia. He was joined in Holy Matrimony to Ernestine M. Dockery, August 3, 1985. They have three sons: Reverend Leon W. Dockery, Jr. (Jackie), Leonard S. Dockery (Lisa), and Walter J. Roy, Jr. (Janese); three beautiful granddaughters and two very handsome grandsons.